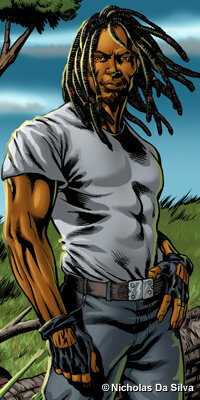 Drew McIntosh from the Dread & Alive series is the best new Black Character of 2010 for a number of reasons. Why he won: All the other nominees are a newer version of already established characters. The peoples choice Aqualad is a black version of an originally white sidekick. Sure there are other bells and whistles but that’s what he is. New Powerman is a mix of Luke and Danny in a modern package. Our winner Drew on the other hand as weird as it may seem is the first Jamaican Rastafarian Superhero EVER! With the far reaching sales of Bob Marley one would think mainstream would have done this already but instead it’s Da Silva who delivers a believable superhero without a cape or cowl but with real world problems relevant to the everyday man. The hairstyle was made popular by Lucas Bishop back in the 90’s other heroes rock the hairdo as well even Aqualad does 🙂 but none of them have ties to the country in which it originated. Drew also gets props for being related to the Jamaican maroons. Black historians types know that they fought against slavery savagely and maintained their independence even during that dark time in our worlds history. Much can be learned from Drew and his many ties to real world Jamaican culture and history. Cheers Da Silva you did good!